Physician assistants protect yourself and your career with a great program that is endorsed by the American Academy of Physician Assistants (AAPA). 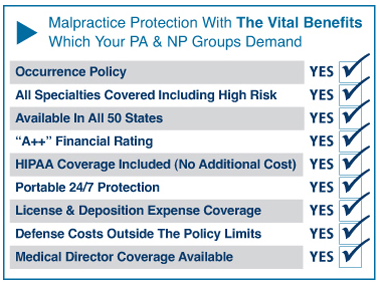 Presidio Insurance knows you don’t want to worry about your malpractice insurance coverage. Our team will help you navigate the process quickly and easily. We have some great programs and options available. We have been helping PA’s find the optimal liability insurance coverage for over fifteen years. Don’t trust all your years of hard work to just anyone. Our team is dedicated to your success. Professional liability/Malpractice insurance solutions for Physician Assistants and other healthcare professionals.